Loose Dry avalanches are usually relatively harmless to people. They can be hazardous if you are caught and carried into or over a terrain trap (e.g. gully, rocks, dense timber, cliff, crevasse) or down a long slope. Avoid traveling in or above terrain traps when Loose Dry avalanches are likely. 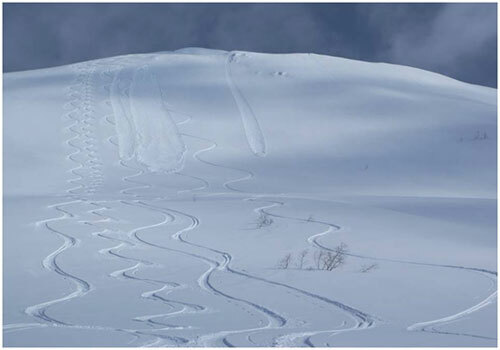 Loose Dry avalanches occur in either soft, powdery, storm-snow, or in old, weak, faceted snow. If the entire snowpack is faceted and sugary, loose dry avalanches can run to the ground. Loose Dry avalanches can exist throughout the terrain, on any aspect or elevation. They start on very steep slopes, usually 35 degrees or steeper. If they release on low-angle terrain, they are usually small slides that do not run very far. 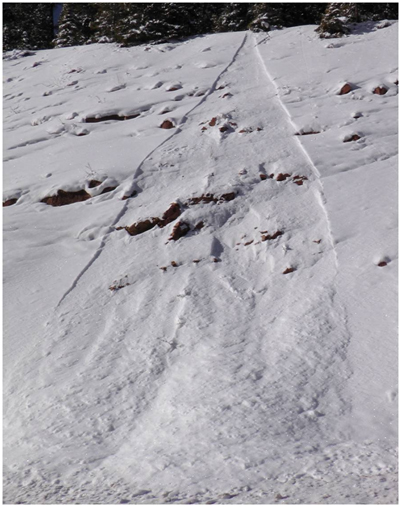 Most Loose Dry avalanches are a non-persistent problem and stabilize in hours or days. There tends to be a short period of frequent natural activity, which often occurs during intense snowfall or with the first sun/warming after a storm. However, human-triggering of loose dry avalanche may be possible any time the snowpack consists of unconsolidated faceted grains. Loose Dry avalanches release below the trigger point. Because it is a surface problem, it is easy to feel and recognize unconsolidated snow. Recent loose-snow avalanches are a good indicator. You may see sluffs or spindrift coming off your tracks or running on steep slopes. Loose Dry avalanches are fairly predictable and can be easily avoided. On large slopes, they can entrain a significant amount of snow and travel very fast. They are most dangerous when combined with terrain traps such as rocks, trees, cliffs, or a gulley. Avoid traveling under steep slopes during heavy snowfall or intense sunshine. Expert riders in very steep terrain can use sluff-management techniques. Loose Dry avalanche triggered by a skier. Loose Dry avalanche with the characteristic point initiation and fan shape.